They aren't the same men. Oh, sure. They look the same. They have the same names, same faces, same mannerisms. They look the same . . . but they aren't the same. On the surface they appear no different than before: Peter is still arrogant and impulsive. Nathanael is still reservedly reflective. Philip is still calculating. John still lives up to his nickname, son of Thunder. But there's something different about them. They aren't the same men you read about in the Gospels. They are the same ones . . . but they aren't the same. You'll see it. As you read, you'll see it. In their eyes. In their voices. In their passion and compassion. They're the same . . . but they've changed. As you read, you might wonder, are these the same guys? The ones who doubted in Galilee? The ones who argued about who's the greatest? The ones who ran from Jesus in the Garden? Is this Peter, the one who denied Him three times? Are these the same men? The answer is no. They are not the same. They are different. They have stood face-to-face with God! They have sat at the feet of the resurrected King! They have listened to His words, tried not to stare at the nail holes in His hands and feet. They have experienced His deep love for them as He calmed their fears, excused their doubts, and forgave their denials. Within each of these men dwells a fire  a burning passion  not found anywhere else or in anyone else on earth. The Father has forgiven them. The Son has loved them. The Spirit has filled them. They most definitely are not the same! And because they are different, the world is different! Read their adventures and be encouraged. Read their adventures and be listening. What God did to them and through them, He longs to do for each of us too! Portions of the above excerpted from "Experiencing the Heart of Jesus", Max Lucado Devotional Bible New Century Version, copyright © 2003, Thomas Nelson, Inc. 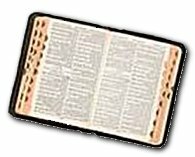 The book of Acts is the only history book in the New Testament. It records events after Christ's ascension, which include the outpouring of the Holy Spirit and the birth of the Church on the day of Pentecost, early Church government, and the missionary journeys of the Apostles [especially those of Peter and Paul]. 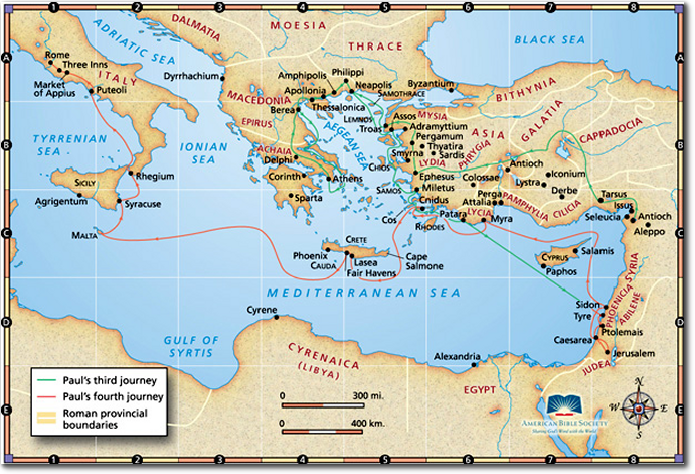 The following maps may be helpful for your study of the geographical locations of events in the book of Acts. Jesus' last recorded words have come to be known as the "Great Commission" (cf. Matthew 28:18-20; Mark 16:15; Luke 24:47; Acts 1:8). This book of Acts (or more precisely "The Acts of the Apostles"), written by the Greek physician Luke, is the story of men and women who took that commission seriously and began to spread the news of the risen Savior everywhere they went. Each section focuses on a particular audience and key personality or a significant phase in the expansion of the Gospel message. While the apostles are mentioned collectively at several points, this book is primarily a record of the acts of Peter (1–2) and of Paul (13–28). TO WHOM: All believers, although the book is specifically addressed to Luke's friend, Theophilus. PURPOSE: The book concerns what Jesus continued to do and teach after His ascension through His spiritual Body, the Church (Acts 1:1-2). Acts 1:8 "But you will receive power when the Holy Spirit has come upon you, and you will be my witnesses in Jerusalem and in all Judea and Samaria, and to the end of the earth." Acts 4:12 "And there is salvation in no one else, for there is no other name under heaven given among men by which we must be saved." LIFE AND MINISTRY PRINCIPLE: The true evidence of the Holy Spirit is His directed power  power to carry the Gospel throughout the known world. 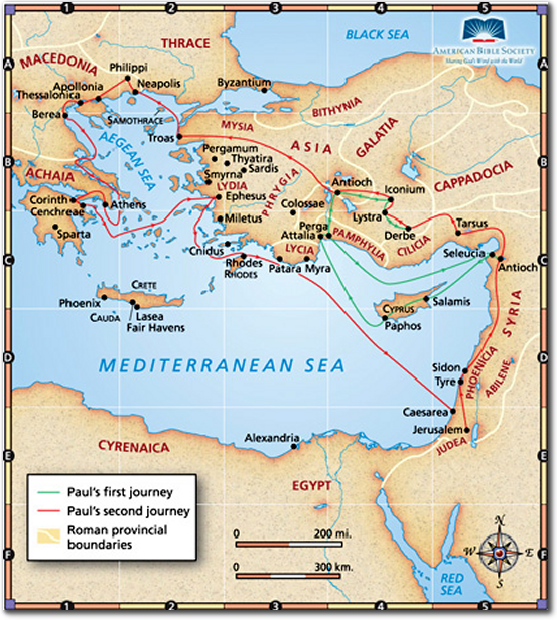 MAIN CHARACTERS: Peter, Paul, Silas, Barnabas, John Mark, Philip, Stephen, Ananias and Sapphira, Dorcas, Cornelius, Felix, Agrippa. 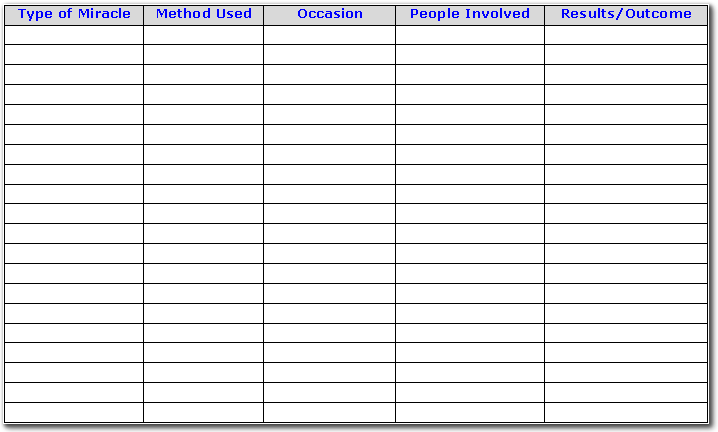 In the following chart, write and study some of the miracles recorded in the book of Acts. Study the sermons in the book of Acts. Use this chart to record your studies. Study the prayers recorded in the book of Acts. Use this chart to organize your studies. The following summary will help you remember the content of the book of Acts.